Leave your general domestic cleaning chores to us and enjoy quality time with family and friends. Our professional, yet personal general domestic cleaning service in Bristol will provide you with a clean and tidy home, and put a smile on your face. You can trust our reliable domestic cleaners to carry out a range of general cleaning tasks that we can customise to suit your specific needs and budget. We provide several domestic and commercial cleaning options, ranging from one-off deep cleans, to weekly spruce-ups, and regular dusting, vacuuming and ironing services. In addition to the abovementioned services, our domestic cleaners can customise any specific general domestic cleaning request. Just let us know what you want doing. 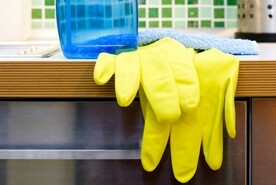 Our trained and referenced cleaners use top quality cleaning products to clean your premises. We offer an extensive cleaning service guarantee that you can rely on. Take domestic cleaning tasks such as ironing and vacuuming out of your to-do list by calling our team today for a free estimate, on 0117 345 9015.